I am making a MH table lamp, and I'm currently in the ballast box construction stage. My problem is, it's too big a look like a table lamp, so should I make it a floor lamp instead? Remote ballast it à la laptop adapter. Otherwise, you might be inspired by the ones in my gallery. One is a 6x6x4 electrical box, and the other is a series of outdoor box extenders. The 6x6x4 box will house a 50W MH magnetic (I haven't tried other wattages) and the box extender one will only fit a small electronic ballast. I'm collecting parts to make a remote ballast table lamp. Not sure when it will be completed, though. It will be 50W MH, with a remote ignitor at the lamp holder. It will be a 6x6x4 electrical box. I'm also in the process of designing (and then building) a portable MH bollard light (for outside, obviously). It would work best remote ballast, however finding a weather resistant metal enclosure at a reasonable price has proven impossible online. I haven't paid a visit at the electrical counter, though. Oh, and a magnetic ballast box would make a nice heavy stable floor lamp base if that is what you want. A magnetic ballast in a table lamp base makes it nice and heavy too. Won't topple over easily. I think what I could do is extend the lamp holder (a vapor tight fixture) about 1 foot above the ballast box to make it look more proportional. Also, do you think THWN wires can handle the high voltages? Ceiling fan down rods work well for that, although you need a threaded flange of some kind to attach to the ballast box. For a permanent installation that will get some use, I'd try to use TGGT for the wires between the ignitor and the lamp. I use electric stove repair kits for that. Some are available with only a few lengths of high temperature fibreglass insulated wire and a few connectors. One of those outdoor round junction box covers with a 1/2" NPT tapped hole in the centre would work to mount the fan down rod to the ballast box. Pretty much any hardware store would sell them too. I never thought of that. I must keep that in my head for the next project. The ceiling fan down rods that Home Depot sells here are 3/4 inch, though. Now that it's almost done, what size fuse should I use? I already have some 4 amp ones, but the inrush current might be too much for them. Circuit breakers are the same way. They can withstand several times their rated current for short durations. 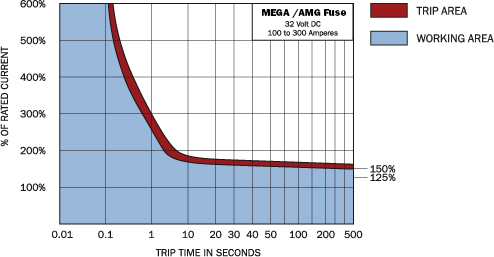 Your 4A fuse would likely be able to sustain 20A for several AC cycles without blowing. Admittedly, I haven't extensively studied inrush characteristics of magnetic ballasts, but it is unlikely to pop a properly chosen fuse. Each inrush wears off the fuse a bit (mainly electromigration and fatigue effects make the filament weaker over time, accelerating these effects even further), so the fuse will occasionally blow for no real reason. Of course, you may use higher rated fuse, but then you loose the protection capability (it won't be able to protect the ballast in cases like mild, but long time mains overvoltage or a rectifying lamp, because with the higher rated fuse the trigger current will become way too high for that functionality). Using slow acting circuit breaker allows you to either set it (if it is the adjustable "machine protector" type) and/or select the rating just what "barely" holds the lamp ON. That way any mess up with the operating conditions possibly threatening the ballast will cause the breaker to trip and so keep the ballast safe. Unlike with fuses, selecting lower current rating does not mean the breaker will wear off more than a higher rated brother (assume of the same family), because what they differ is just the adjustment of the trigger mechanism, the contacts are all the same (and correspond to the highest current rating available in the given family). It only means the conditions leading to tripping become a bit more often. But because these are the same conditions potentially harming the ballast, I won't call that a bad thing at all. For the 4160V circuits here at work-some of our drawout breakers have fuses in them---fuses give better short circuit pretection over breakers-the fuse will blow faster.Two of our transmitter breakers are this way.Some LV drawouts--208,480V are the same way-like at 1000A or greater.Stored energy remote trip. For installations with really high short circuit currents indeed, but then for the short protection the exact fuse current rating does not matter that much, the short circuit overload is then dictated by the generic fuse construction (arc management methods,...) rather than its exact rating (the fuse link wire gauge). So when in combination with a breaker you may put there high enough rating to have good margin from the ballast input currents. The breaker will take care of the lower current faults (rectifying lamp,...), the hard short circuit in the wiring will be then handled by the fuse. But in normal installation this complexity is not required, because even during the short circuit the current is limited (by the inherent wiring impedances) to a reasonable level for the common breakers to handle safely without the added fuse. Or better to say the common breakers are designed for the short circuit currents expected in the normal installations. I do not know how exactly the US NEC, but here the electrical code specifies the maximum short circuit current allowed in home installations (at the feed point to the main meter; in industrial installations this applies for all regular socket and normal room lighting circuits as well) as maximum 6kA. The utility company should make sure this limit is never exceeded, include all the allowed tolerances. So if the distribution line exceeds it, they have to install short circuit current limiting devices (most common are "air core" reactor coils, in industrial installations are often used arcing contact limitters - two contacts pressed together by a spring, but separated by the magnetic field from the flowing current, so adding an extra arc impedance in case the short circuit current reaches the set limit; these are way more compact than the chokes and very often this feature is integrated as a part of the circuit breakers, mainly those rated for the higher breaking current capability).